so, back to back issues of Time Magazine featuring Princess Di and Mother Theresa. It's been a decade since their death (they died the same day). The coverage of the Princess suggests that her inclination to stand on the side of the oppressed and cross the barriers of royalty and propriety in favour of close proximity with the hurting launched the Royal family into relevance in British culture. The brand new book of Mother Theresa's journals and letters reveal that her identification with the suffering of Christ included feeling alienated from God Himself. I had heard years ago that the day Mother Theresa started her work with the poor was the day the visions stopped. Her explanation was that God used to reveal Himself to her in visions but He started revealing Himself in the distressing disguise of the poor. For over forty years she dealt with the darkness of her soul by willful obedience to her last revelation. Wow. There are many contrasts between them. 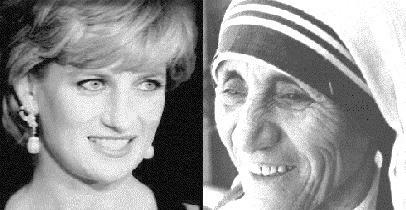 But the thing that strikes me is that I'm much more like Princess Di then Mother Theresa. I'm fickle, tempermental, conditional, and vain. She was steady, true, unconditional and humble. I've got a long way to go. I also wondered at her long, persevering spirit of obedience... I'm praying for the gift... although perhaps it was more of a burden. In any case, I'd like to be more like the saint than the princess. God help me.